The Russian Central Bank added 300,000 ounces (9.3 tons) of gold to its reserves in December, bringing the total acquisitions of the precious metal in 2017 to a record 223 tons. Since June 2015, the Central Bank of Russia has added over 558 tons of gold, and December’s 9.3 ton addition brings the official Russian gold holdings to 1838.211 tons; the sixth most of any nation, close behind the People’s Bank of China. In dollar terms, Russia's gold reserves are now worth $76.647 billion and constitute 17.7% of overall Russian reserves. Meanwhile, Russian holdings of U.S. Treasuries were just above $100 billion for eighth month in a row. 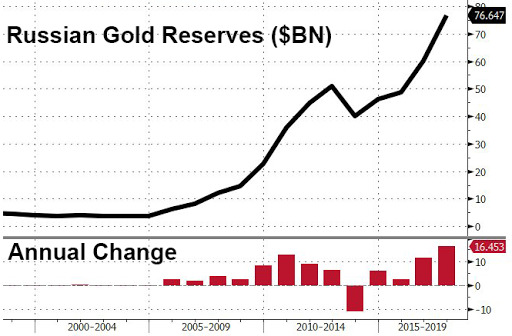 The message - as Russia continues to add gold to its official reserves while keeping its holdings of US Treasurys generally unchanged - needs no explanation.